In December of 2018, The United States Department of Agriculture released its final rule on the labeling of genetically engineered foods, setting up a mandatory disclosure standard for all bioengineered products sold in the U.S. The goal of this ruling was to promote greater transparency within the food manufacturing industry, yet many consumer advocates believe the standard does not go far enough. "In its current form, categorical exemptions prevent this law from delivering the meaningful protections Americans deserve," said Megan Westgate, Executive Director of the Non-GMO Project, in a public statement. "Highly processed ingredients, many products of new genetic engineering techniques such as CRISPR and TALEN, and many meat and dairy products will not require disclosure." The USDA's rule exempts the labeling of meat, eggs and dairy sourced from animals that were fed a wholly GMO diet, a practice that many advocates find deceptive. In a late-December article from Seafood Source, Wenonah Hauter, Executive Director of Food and Water Watch, commented that the USDA's new rule is "filled with loopholes" that may allow manufacturers to skirt around explicit disclosure by using digital QR codes in place of on-package labels. Consumers would need to scan these QR codes to find out whether a product was genetically modified or if it contained BE ingredients. GMO salmon is still not approved for sale in the U.S., but Canadian consumers have seen it on the shelves since 2017. Back in 2015, federal regulators from The U.S. Food and Drug Administration approved the nation's first genetically engineered salmon for human consumption. The initial proposal was submitted in 2009 by AquaBounty, a Massachusetts-based biotechnology company, which had to wait several years before it got an answer from the agency. According to documents from the Congressional Research Service, AquaBounty was interested in genetically modifying Atlantic salmon to grow larger and faster by introducing a growth hormone taken from Chinook salmon, which would cut the maturation period from three years down to just 18 months. AquaBounty argued that their new breed of fish, named the AquAdvantage salmon, would reduce the pressure on wild populations caused by overfishing and would be raised in landlocked facilities to prevent environmental complications should any escape into the open ocean. Despite the FDA's approval, an update to the 2016 Omnibus Appropriations Act forced the agency to issue an Import Alert on AquaBounty's salmon, barring it from sale and/or delivery until final labeling guidelines for BE salmon were created and released. 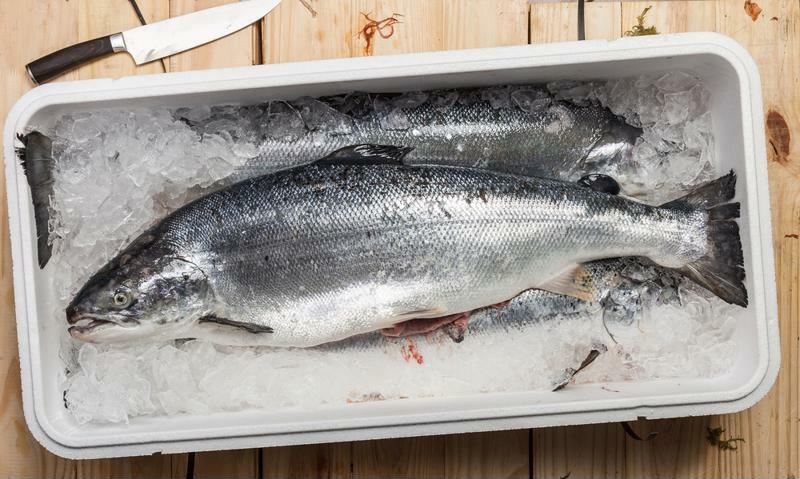 This Import Alert is still in effect three years later, but the USDA's final ruling may pave the way for AquAdvantage salmon's commercial release. Following the USDA's release of its final labeling rule, a bipartisan group of senators filed a bill that would compel fish producers, manufacturers and importers to clearly label their genetically modified products with an explicit warning. The bill, called the Genetically Engineered Salmon Labeling Act, is aimed at closing the indirect labeling loopholes that critics have been warning about. If passed, companies would no longer be able to use digital QR codes or toll-free numbers to meet the BE labeling obligation for salmon. "USDA's new guidelines don't require mandatory labeling, and instead allows producers to use QR codes or 1-800 numbers, which is a far stretch from giving consumers clear information," commented Alaskan Senator Lisa Murkowski in a late-January press release. "There's a huge difference between genetically engineered salmon and the healthy, sustainably-caught, wild Alaskan salmon. My legislation will ensure that consumers have all the facts, allowing them to make more informed decisions when they purchase salmon." "75% of processed foods sold in U.S. supermarkets contain genetically modified ingredients." The bipartisan group, comprised of senators from the Pacific northwest, argues that consumers have a right to know what's in their food and that food manufacturers have a responsibility to make that information readily available. The issue with QR codes is that a smartphone is needed to scan the packaging, which negatively affects customers who may not have access to mobile technology or a reliable data plan. AquaBounty is one of the many salmon producers that would be impacted by the bill, even though its genetically modified products have still not cleared the FDA's labeling guideline review process. The biotech company came out in full support of the USDA's final ruling, calling it a major step toward sustainable fishing practices. With the global consumption of seafood on the rise, AquaBounty believes that new "aquaculture methods" are necessary to alleviate the stress placed on fish stocks and to keep up with demand moving forward. Over the past decade, consumers have become increasingly interested in food transparency, in part due to the ongoing debate over whether GMOs pose serious risks to human health and wellbeing. This trend has put a lot of pressure on food manufacturers, as many of their base ingredients come from bioengineered sources. According to The Center for Food Safety, around 75 percent of processed foods sold in U.S. supermarkets contain genetically modified ingredients. Close to 92 percent of U.S. corn and 94 percent of soybeans are genetically engineered, which raises questions about the future of food manufacturing. While the debate over genetically modified ingredients is nothing new, there are plenty of exciting opportunities to leverage consumers' interest in non-GMO products through transparent marketing and labeling strategies. Federal regulations will continue to evolve in coming years, which is why a flexible and scalable labeling infrastructure is as important as ever. Regulations change almost as quickly as consumer preferences, so be sure to view our high-quality label printers at DuraFast's U.S. store or Canada page.